Most humans love to eat corn straight off the cob, and this is true for many dogs. 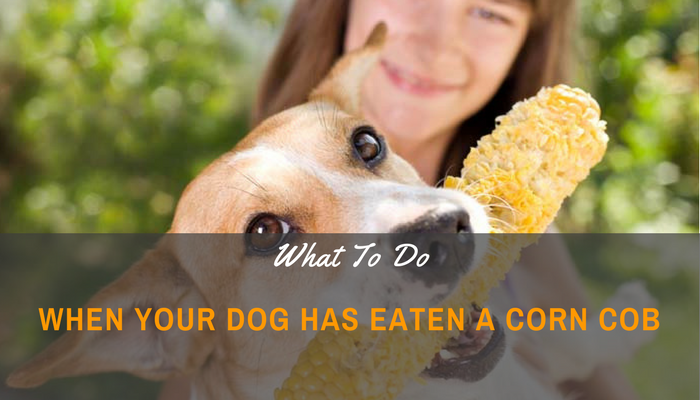 However, even when your dog loves to eat corn, keep in mind that the actual cob can pose a threat. This is because if swallowed whole, the dog is unable to digest the solid cob. When your pet has eaten a corn cob and then swallowed it, it can result in a blockage better known as an obstruction inside the intestines of the pet. This can result in a life-threatening issue even when it comes to smaller corn cobs or chewed pieces. Symptoms can range from very simple onto dramatic, dependent on the location of the corn cob. The more common symptoms to look out for will include vomiting, discomfort or your dog loses his or her appetite. You may also find that your dog is passing smaller feces than usual, or they become constipated and are unable to pass a stool. Avoid waiting. You should get your dog seen to immediately. If you are unsure if the animal was unable or able to digest the cob, rather be on the safe side and take your dog to the closest vet. This is even more important when your dog has vomited repeatedly, or they have diarrhea that has lasted for more than 24 hours or they have started behaving strangely. Dependent on how big the cob was that was eaten, your vet will ask you to watch the animal closely for symptoms associated with an obstruction or blockage. If your pet is still ill, ask your vet for X-ray's to examine for any signs associated with a blockage or obstruction. However, due to the fact that a corn cob will not always show-up very clearly in an X-ray, a recommendation for surgery will be mainly be based on the information you are able to provide your vet with. If an obstruction is left in the intestines for extended periods the site of the obstruction can end up tearing. This can result in a devastating or life-threatening complication, that will result in the need for emergency surgery. The initial diagnosis as well as the treatment will be conducted at the vet. The most common treatment for an obstruction will include surgery. This involves removing the corn-cob which is causing an obstruction inside the animal body. In addition, other treatments will be necessary to deal with any secondary-effects when needed. This may involve administering IV fluids to help the dog stay hydrated. As soon as this condition has been diagnosed the better the chances of a successful outcome. In a few of the nonsurgical cases, the vet will inject apomorphine into the dog vein which causes the dog to vomit up the corn cob. However, this treatment is only possible shortly after the dog has eaten the corn cob before it as had a chance to move down into the intestines. In certain cases, you might be lucky, and the dog will be able to pass the corn-cob out on his own without any issues. But there are many times when surgery may be your only option to successfully remove the blockage. After the initial treatment, you need to watch the symptoms and how they progress. It is very important that you are able to replace any lost fluids which are often caused from excessive diarrhea or vomiting to make sure your dog does not become dehydrated. After the surgery it is advisable that you restrict your dog activities for a few days. In addition, the diet of your dog should be made up of foods that are bland for at least 2 days until wounds that were caused from surgery have enough time to heal. This should then be followed with gradually returning the dog to his or her normal diet. It is important not to let your dog eat any food until the vomiting has come to an end or the obstruction has been removed. If you are aware that your dog usually eats certain items that are regarded as indigestible you need to cut off the access to these items. Since most dogs have the ability to find items anywhere, your only choice is prevention. Do not give your pet leftover corn-cobs after you have finished eating dinner. If you throw them away in compost or your garbage bin, make sure your dog is not able to find them. Keep in mind that if your dog is prone to digging up rocks or finding corn cobs followed by eating them, this situation will happen again. Even worse, if your dog is small or a puppy he could die. If you have a dog who prefers to spend most of his or her time outdoors, you may want to consider putting a basket muzzle on to stop the dog from chewing on undesirable items, especially when you take your dog on a walk. Unlike the majority of other vegetables, corn cobs cannot digest inside your dog stomach. They can be compared to a type of plastic which means they are prone to causing blockages or obstructions. Even worse, this type of obstruction can lead to a perforation when they have been left long enough to travel through the dog intestines. When your dog has eaten something like a corn-cob or any other object that should not have been​​​​ eaten, it is always advisable to contact your vet immediately.